Leading insurance broker, Cowens Survival Capability, part of Cowens Group, has strengthened its growing Mansfield team with the appointment of two new Senior Account Handlers. Claire Thompson and Daniel Ryan join the business’ head office to help manage and grow its portfolio of commercial accounts. They join Cowens at a crucial time, as the newly rebranded company looks to expand its reach across the Midlands and beyond. Bringing over 10 years of experience to the business, Claire gained her skills through the Allianz scholarship programme, before earning her insurance diploma three years ago at Chesterfield based broker, Spire. 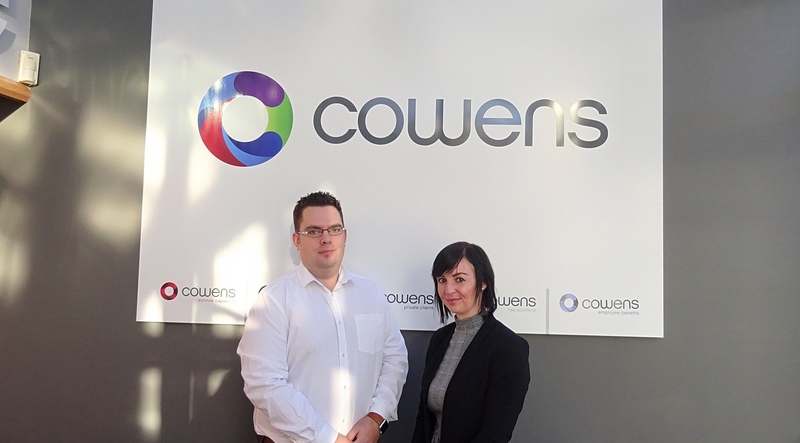 After looking for a new challenge at a larger firm, she applied for the Senior Account Handler role at Cowens. She said: “I came to the office and saw what a great place Cowens is and decided it was definitely an opportunity I wanted to pursue. Cowens is a much bigger brokerage than I am used to, and I was ready for that type of career progression – the company is serious about investing in its employees to learn continuously and gain new qualifications. I hope to gain the ACII accreditation to become chartered in the next couple of years. “I have already learnt so much in the short space of time I have been here and I’m working on such a varied portfolio of clients within all sectors from property to fleet. The team have been lovely and are always willing to help one another. No one is treated as a number; the business really cares about its staff and there is a real family spirit. Daniel began his career in household claims and fleet insurance before making the move over to insurance broking at HTC Associates in Ripley, where he gained his cert CII qualification in broking. After looking for a new challenge, Daniel took on the role of Senior Account Handler at Cowens’ Mansfield headquarters in the same week as Claire. He said: “Working at a larger broker has already opened so many doors for me – I’m working with some big clients within a varied and interesting mix of business sectors. My aim is to undertake my diploma in insurance over the next year and being at Cowens puts me in a great position to do that – the company structure in place provides good scope for career progression. Cowens Group, which has four branches across the UK, is one of the Midlands’ only chartered independent insurance brokers. Following the company’s rebrand at the end of 2018, it now looks to grow its team of insurance and finance experts. “We’re delighted to welcome Claire and Daniel to our team in Mansfield. At a vital time for us in terms of development and growth, both new appointments represent the high quality of service that is so important to us and have the qualities we were looking for.